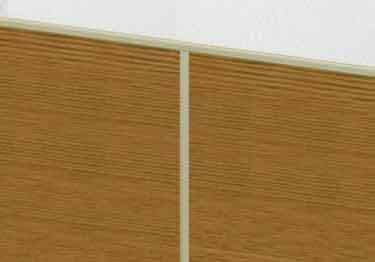 Save your walls from dents, scratches and scrapes and eliminate the hassles of costly repairs with rigid, durable PVC wall panels, strips, and rolls in beautiful faux wood tones. Available in 2 thicknesses and over 20 wood-like color options Inpro®''s rigid wall panels, sheets and rub rails protect your walls while looking great! 4" x 8' rigid vinyl wall guard panels come in two thickness: .040" and .060"
Need an Adhesive? Click here! ! Koffler has what you need. Rigid Flat Panel Sizes: 4 ft. x 8 ft.
Rub Rail Sizes: 4 in. x96 in., 6 in. x96 in., and 8 in. x96 in. Does the product have a texture or grain? Can this product be painted? Save your walls from dents, scratches and scrapes and eliminate the hassles of costly repairs with rigid, durable wall panels, strips, and rolls in beautiful faux wood tones.